Canadian songstress Joni Mitchell has written some seminal works in her time, not the least of which is Big Yellow Taxi. "Don't it always seem to go, that you don't know what you've got 'til it's gone." A salient and poignant reminder that too often we do not see what is of enduring value right in front of our noses. Much of late has been made of the heritage issues facing Hamilton: what to protect, what to relinquish and what to really hunker down and fight for. Ultimately, all heritage fights are about preserving a tangible asset that has proportionately defined the evolution of our commonly held civic character and uniquely local cultural identity. These things profoundly represent what and where we've come from. It goes without saying that some items are more important then others. In the face of natural growth and development, we do have to discriminate. We must choose the most significant that best reflect our changing history. One outstanding architecturally-defining structure that needs a fight, right now, is the Beach Canal Lighthouse. 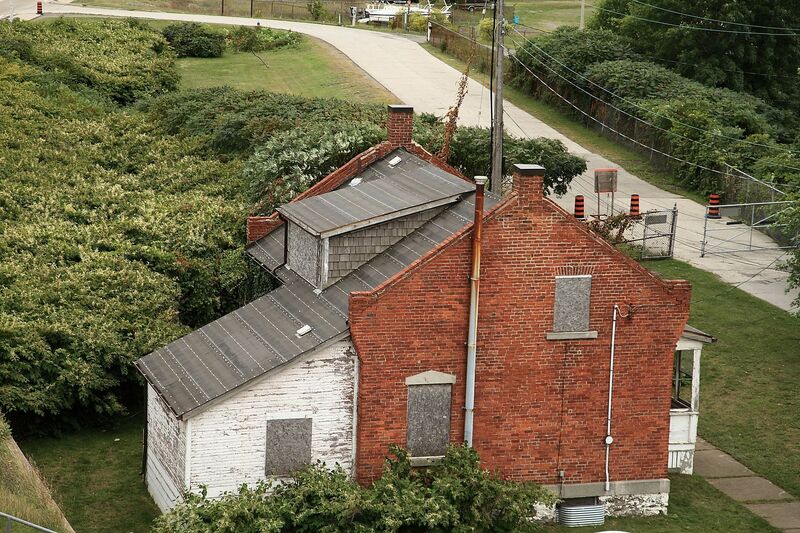 In the simplest of terms, this decaying building and adjacent lighthouse keeper's cottage, scrunched up beside the Lift Bridge operations tower and Eastport Drive on the Hamilton Beach Strip, are on the verge of collapse. Some cynics would suggest that perhaps this decaying state personifies the Canadian Federal and Ontario Provincial governments' hope that these buildings will just quietly fall down, thus saving demolition and dismantling costs. A soiled, cracked and fading information signpost near the lighthouse amplifies this perception. That any level of our Government would allow this site to just disappear is clearly a tragic and mammoth historical loss for us all. It needs to be stated again and again: this important landmark, the lighthouse, has shaped this end of Lake Ontario's development for well over two hundred years. That is no small thing in historical terms or our history. As it is now, this sorry dilapidated fenced-in site is the first identity marker of Hamilton that travelers and trade merchants see when entering the City by water. These abandoned buildings stand in the foreground. The car cacophony of the bridges rages in surround sound overhead, and the steel mills bellow smoke and fire in the background. Talk about an image problem - but it doesn't need to be this way. Consider this: The Province of Upper Canada was created under the Constitutional Act of 1791. The British Crown appointed a young military officer, John Graves Simcoe, as lieutenant governor of this nascent nation state. He was a successful military man, abolitionist, husband, father and eventual founder of York (aka Toronto). Initially, Simcoe set up the colonial capital at Newark, or, what is now known as Niagara-on-the-Lake, on the south side of Lake Ontario. Over the next decade, his regiment, the Queen's Rangers, constructed the two primary arterial roadways through the dense bush that would define the province for centuries to come: Yonge Street from Lake Ontario up to Lake Simcoe (yes, named after him) and Dundas Street from Toronto to London, Ontario. During his early years in this burgeoning colonial settlement, he, his young family and military entourage would travel the existing overland 'native' trail along the Lake Ontario beach strip. They went back and forth from "enemy exposed" Newark near the American border to the safer military fort around the lake at York. It was on one such occasion, while Simcoe and his wife, Elizabeth, were admiring the waterfront landscape, that he decided to establish the Kings' Head Inn on what was then known by the local aboriginal people's as daonasedao or "where the sand forms a bar". Not only was this a convenient and enchanting stop-off point for the long and bumpy four-hour carriage ride from York to Newark, but also the Inn served, at various stages, as a military trading post and Government House for the growing British colony in the years ahead. Elizabeth eventually wrote glowingly of how the Kings' Head Inn was "beautifully situated" on the beach strip. Fast-forward 200 years. All that remains of this beguiling moment in Canada's young history is a provincial plaque somewhere on a northern trail at the back-end of the eponymous hot-dog and hamburger joint, Hutch's, on the lake. That's it. The original two-storey, two-winged wooden building that constituted the Kings' Head Inn was destroyed in a fire by American troops in 1813. Over time, the land and property were eventually absorbed into the overall development of the area. And so goes local history. All that remains of the King's Head Inn is a wooden pub sign - and, at that, it is a reproduction. The original pub sign has disappeared. The handsome oak replica is now in storage in the attic at the somewhat forlorn historical museum, the Joseph Brant Museum in Burlington. It is not visible to the public. It's worth noting that this Burlington community museum is a reconstruction of the original homestead of Mohawk chief and British captain Joseph Brant Thayendanegea (1742-1807). Brant was awarded 3,450 acres of land at the 'head-of-the-lake' in 1798 by Simcoe, acting as the representative of King George III, for his services to the British Crown during the Seven Years War and the American Revolution. The land grant was awarded to Joseph Brant just five years after the King's Head Inn was ordered built by Simcoe. On my request, the museum curator kindly supplied me with this backside image of the Kings' Head Inn pub sign. It's a beautiful re-created portrait of King George III. Notably, there are lots of other Kings' Head Inns pub signs online via Google Image Search. Alas, there is no image online for the for the very first Kings' Head Inn pub sign of Upper Canada, and the young nation state of Canada. Sadly, the Joseph Brant Museum hasn't even included it in its listings with the Canadian Heritage Information Network (CHIN). All in all, the sign - and the Kings' Head Inn - are out of sight and thus out of mind. Gone. This local structure of historical note has been lost and all but forgotten, except by the oldest historical association in the Golden Horseshoe area, the Head-of-the-Lake Historical Society, founded in 1899. This society still uses the fine painted portrait of King George III from the backside of the King's Head Inn pub sign, in miniature, for their society's crest. The Beach Canal Lighthouse is en route to a similar fate. 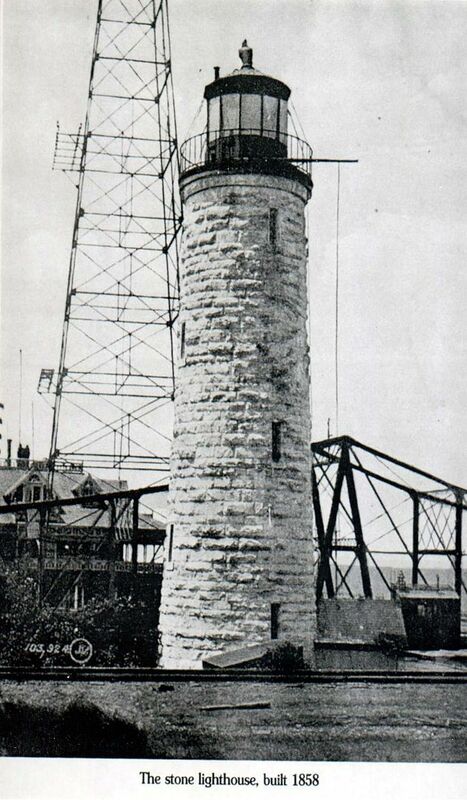 Originally built in wood at a height of 40 feet in 1838, a mere 44 years after the Kings' Head Inn, the whale-oil lit lighthouse was a beacon for the frigate and steamships passing in and out of the Hamilton Harbour and Burlington Bay via the newly dug Burlington Canal, which was officially opened in 1832. On July 18, 1856, the steamship Ranger, chugged into the canal. Hot sparks blew from its engine chimney onto the shore. The resultant ember fire eventually destroyed the wooden lighthouse, the canal ferry, and two houses before the fire was subdued. 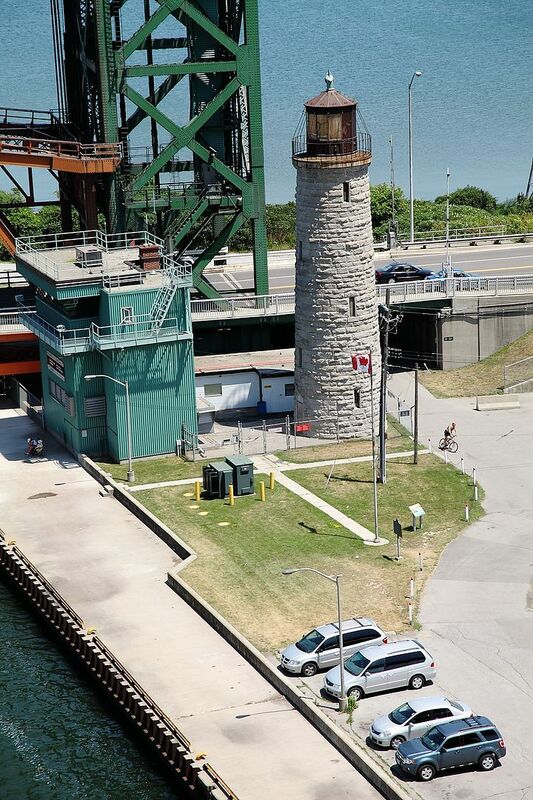 A temporary lighthouse was quickly assembled to assured continued safe passage into the harbour, and then, in 1858, John Brown, a seasoned stonemason, was hired to construct a permanent white dolomite limestone structure on the south side of the canal. The Canal lighthouse is identical to another that Brown designed and built on Christian Island on Georgian Bay. Standing five stories high, the walls of the Beach Canal Lighthouse are, at several points, a few feet thick. Overall, the stonework is 'stable', but it still needs a lot of work to bring it, and the lighthouse keeper's cottage, back to any semblance of their former functional selves. During its operation for over 100 years, coal was used to light the beacon instead of whale-oil. The light was visible from miles out on the lake. It was a welcoming and familiar signpost into one of Lake Ontario's best natural harbours. The Beach Canal lighthouse was officially closed in 1968, a mere 45 years ago. It has been in slow decline ever since. Today, a automated electrical beacon on the end of the south side pier on the canal guides the lake traffic in and out of the harbour. Meanwhile, that stalwart old stone lighthouse continues to slowly fade, like the Kings' Head Inn, from public memory. But not all is lost just yet. Ten years ago, in 2003, two forward-thinking individuals from the Hamilton Beach Community organized a meeting to attempt to save the lighthouse and the lighthouse keeper's cottage from oblivion. Thirty-two people turned up. It's been a slow uphill battle ever since. Over the past decade, only 200 interested citizens from all around the Golden Horseshoe region have joined the Beach Canal Lighthouse Group, donating their time, money and professional expertise. This group is certainly moving in the right direction, but it is evidently not enough, especially when time is increasingly of the essence for these buildings. In 2004 the owner of the site, the Canadian Department of Public Works and Government Services, basically fobbed off the 'surplus' property to the Department of Fisheries and Oceans. 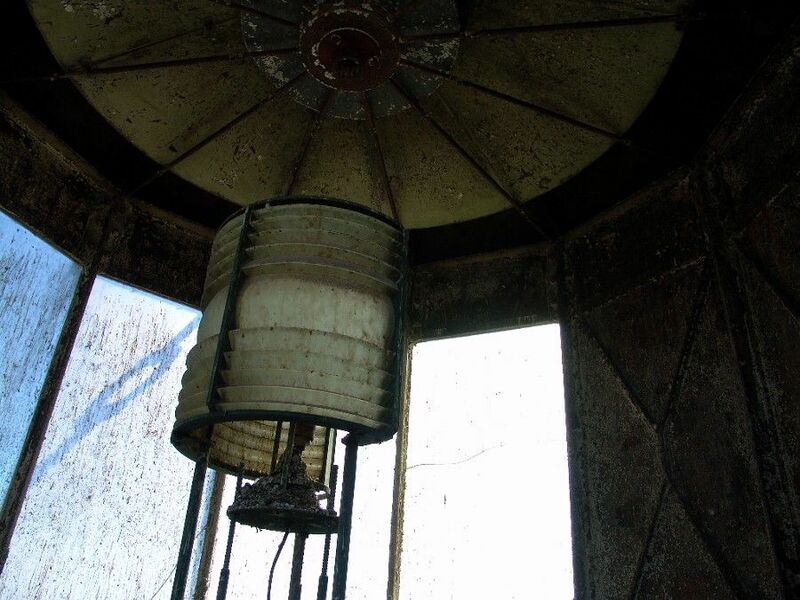 In 2006, the DFO removed the accumulated bird guano and the remaining lighthouse lens from the tower. They boarded up the doors and windows of the cottage with plywood. Three years later, the Department of Public Works and Government Services rescinded their offer to the DFO and refused to hand over title to them or the non-profit Beach Canal Lighthouse Group. In other words, this property continues to swill around in limbo on federal/provincial/municipal backwaters as a lamely identified place of historic importance under the Ontario Heritage Act. In 2007, the Beach Canal Lighthouse Group received a plaque indicating this status from the City of Hamilton. The fact remains, the City of Hamilton has not taken full ownership of this property, as it should. The lighthouse really deserves the same attention, investment and tourism rehab as Dundurn Castle. Hope remains. A re-energized committee at the Beach Canal Lighthouse Group is trying, again, to re-engage both the public and civic elders to take responsibility for the lighthouse. It, and the lighthouse keeper's cottage, do not have to got the way of the Kings' Head Inn. 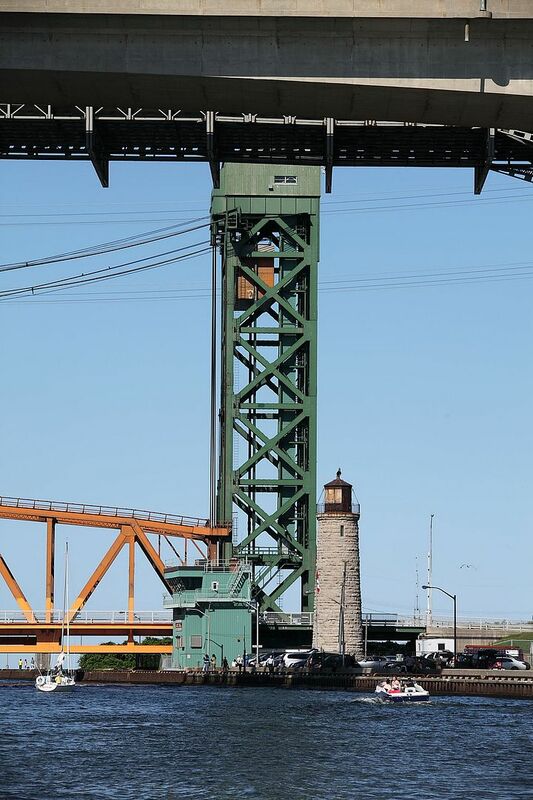 There is still some time to save this sturdy pillar, albeit in need of serious restoration, that represents the waterfront origins of the City of Hamilton and our regional history. Hamiltonians, Burlingtonians and all Canadian citizens around the Golden Horseshoe region must band together to reiterate that they do know what they've got before it is all gone. A full-on restoration of The Canal Lighthouse would be best, regardless of the current inhospitable location. Perhaps a lend-lease could be established with the City of Burlington? If they absorbed some of the restoration costs, maybe the Province and Hamilton would permit a relocation of the lighthouse and cottage into their ambitious design for the City of Burlington Beachfront Park. Perhaps it could be relocated to a position of prominence in Bayfront Park, or integrated into the Haida dock site under the auspices of the Hamilton Harbour Commission. Or it could be moved to a mountain location at Chedoke so that the illuminated lighthouse could preside over the City. Needless to say, more must be done now to save this unique waterfront structure before it falls down. Ergo, Hear ye! Hear ye! - Get involved, donate, learn more about this unsung piece of local history, bookmark the following link to the Beach Canal Lighthouse Group, and please, open your wallets, give generously: http://www.bclg.ca/. The Lighthouse really does need our energy, attention and money. Now. Remember Joni's wise words, or else we really won't know what we've got until it's all gone. Credit notice: All black & white photographs are from the 'PreView' Archives of the Hamilton Public Library. Colour imagery is by Margaret Lindsay Holton, except for the Christian island lighthouse image, courtesy of Google Images. The Kings Head Inn pub sign image was supplied by the Joseph Brant Museum and is used with their permission. Love this piece. Was just down there the other day looking at the lighthouse and cottage, wondering when we will fix it up. I don't think it should be moved, but restored right on site. Complete the project by making the Hamilton pier a wooden boardwalk as it was way back in the day, with benches facing the water on both sides from end to end. Open the top of the lighthouse for public viewing and we've developed an incredible night out in a Great Lakes Industrial port. Let's be honest with ourselves - the location is terrible. Look at the similarly located and constantly empty Museum of Steam Technology. If the city had some impressive investment planned for the whole area surrounding the darned thing? Yes, it could work. But as it stands? This isn't the Gore, where buildings were in-use downtown. This isn't the Board of Ed, which could have been renovated for a reasonable sum and was an active, functional office building. This isn't even Sanford School that had potential as a condo development and was located in a residential area. With its mediocre location, this lighthouse would be another Shiela Copps Discovery Centre. The city has a million little museums dotting its landscape, and they're almost uniformly underutilized. Adaptive reuse implies use. Unless something more dynamic and clever is done with these structures, it's going to be pickled and forgotten at substantial expense. One more white elephant sucking up the city's funds that could go to projects where Hamiltonians actually live. To be fair, the city hasn't committed to anything. The closest they've come is a very loose hint at a matching-funds "commitment" where the third-party buy-in is so high ($359K) it seems unlikely to be met. If heritage advocates can rustle up that much through Indiegogo, we might see a more concrete commitments from government. Politicians seem to notice money moving around. I agree that the site, as it currently stands, is not the best to maximize the opportunity that the lighthouse provides, but that fact doesn't deter the potential itself. What this 'project' needs is a 'local champion' who 'gets it'. I mean, really 'gets it'. The lighthouse needs those who can tap this potential in a 'clever and dynamic' way, as you say. That's why an adaptive re-use, that provides more than a 'tower tour', is essential. Jason has some good ideas, as do others on this thread. More credit to them. By the way, the lakefront is NOT mediocre, (except insofar that industrialization have made it so without THOUGHT of 'Pride of Place'), and there are plenty of people who do live 'down here', let alone those who come solely to 'play' here. The lakefront is not a 'backwater'. It is, in fact, the water FRONT. We could outfit the lighthouse with LEDs too, changing its colour to match/complement the ambient temperature and strobing red when there's an EC extreme weather warning posted for the area. "At the April 20, 2011 Emergency and Community Services Committee, Culture Division staff were directed to investigate and report on the availability of capital contributions from other levels of government, foundations, and the private sector, for the restoration of the Beach Canal Lighthouse and Lighthouse Keeper’s Cottage. A 2009 assessment, identified that a capital investment of $820,060 was required to restore the Beach Canal Lighthouse and the Lighthouse Keeper’s Cottage. At this time there are no identified funding programs from Federal or Provincial sources available to municipalities for the conservation and restoration of Beach Canal Lighthouse & Lighthouse Keeper’s Cottage. 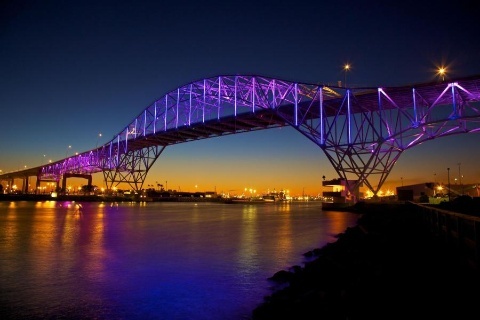 The results of the investigation into government and other public funding authorities whose objectives align with the restoration needs of the Beach Canal Lighthouse complex are attached as Appendix A to Report CS11018(a). Phase 1 (the restoration and stabilization of the building envelopes) is estimated at $669,250; which includes the initial capital investment for security of $22,500. Phase 2 (interior restoration and interpretation) is estimated at $150,810; which includes the initial capital investment for land use of $2,000. 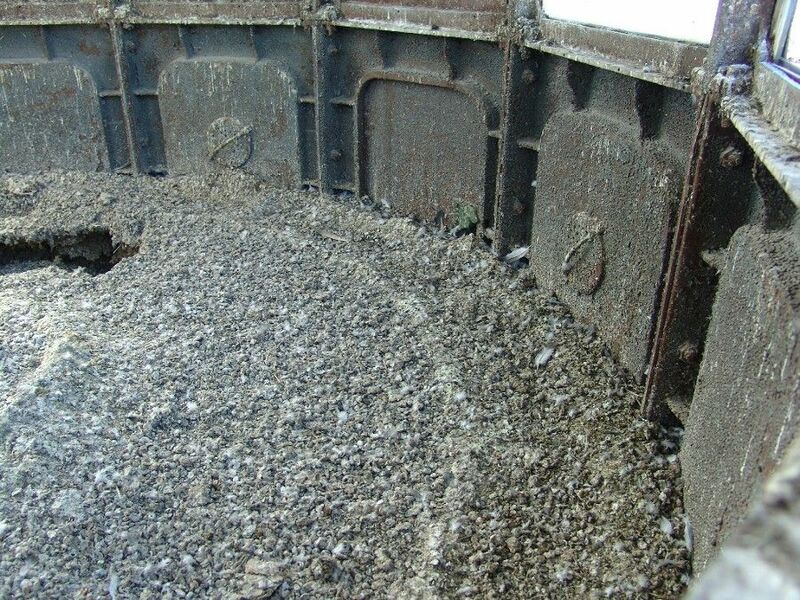 The Beach Canal Lighthouse project does not meet the priorities and qualifiers of most Federal government museum or heritage funding programs. Parks Canada and the Department of Canadian Heritage require the site to be under a Federal heritage designation (e.g. a designated National Historic Site) before consideration will be given for funding a restoration project. At present, the Beach Canal Lighthouse & Lighthouse Keeper’s Cottage have only Provincial designation through a heritage easement with the Ontario Heritage Trust. Provincial and private sector funding program requirements indicate similar challenges. In general, municipalities are not eligible for funding under the terms of most provincial grant programs. 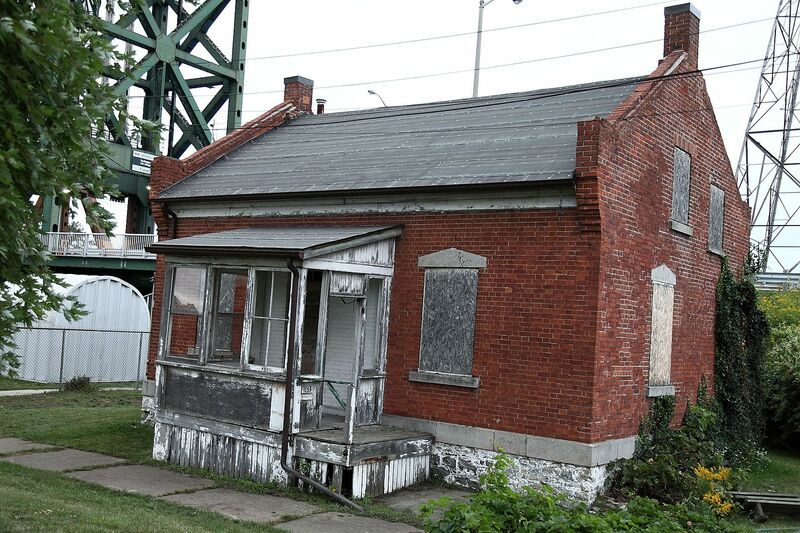 Further, from discussions with Department of Public Works and Government Services Canada (PWGSC) and the Department of Fisheries and Oceans Canada (DFO) staff, it is clear that no final transfer of the Lighthouse and Lighthouse Keeper’s Cottage to the City of Hamilton can take place without a secured restoration budget (from municipal or grant sources). A third party organization would have access to a wider variety of available funding and would have the structure and capacity to fundraise. Grant applications would have to flow through a third party organization, with some restrictions. For example, The Ontario Trillium Foundation would consider a capital fund request in a municipally owned facility provided the applicant is eligible under Ontario Trillium Foundation guidelines and can provide proof of a minimum five-year lease for the facility. Also, priority is given to applicants that can increase access, demonstrate community need and have a strong multi-cultural community mandate. Similarly, the Federal Department of Canadian Heritage program, Building Communities Through Arts and Heritage, would be a possible funding source for a third party organization. However, the third party would have to provide proof of lease and the application would have to be linked to a legacy or anniversary; an example being the 175th anniversary of the original Lighthouse in 2013. This alternative would also require that the Department of Public Works and Government Services Canada (PWGSC) and the Department of Fisheries and Oceans Canada (DFO) agree to the transfer of ownership with the understanding that the site would be operated by a third party. Although this option has been discussed with both agencies, no agreements have been reached to proceed with negotiations on that basis. Any grant application submitted by the City of Hamilton or by a third party organization will, most likely, require a commitment of matching capital funds. In some cases, matching funds can come from another public source but these grants are generally not available to municipalities and would require an application from a third party. Report CS11018 Beach Canal Lighthouse & Lighthouse Keeper’s Cottage: Assessment of the City’s Future Plans, received by Committee on April 20, 2011, estimated the capital investment at $820,060. With a phased approach, the initial costs would be $669,250; which includes the initial capital investment for security of $22,500 for the restoration and stabilization of the building envelopes. If the City of Hamilton were to commit matching funds, an initial commitment of $334,625 would be required by the City of Hamilton." If Indiegogo (via Gawker) can generate over $200,000 for a video of Toronto's Mayor 'allegedly' smoking crack, WE can rustle up the funds to save a chunk of history ... To get bogged down in the 'swill' of bureaucratic red-tape due to 'classification', little will happen. Interestingly, the Lighthouse Digest from Maine, USA, has just expressed interest to 'help', (via Twitter), with additional 'exposure'. (Somewhat ironic that it may be the American's who come to the rescue after trashing the Kings' Head Inn in 1813 ..!) STILL, at this stage of the game, the point is to regenerate public interest in this important CANADIAN landmark, and continue to push for public and private funding. Contact the Burlington Canal Lighthouse Group at www.bclg.ca ~ (wrong suffix was accidentally posted in the article) ~ and get involved. The Group could use your help: enthusiasm, fund-raising and publicity. Agreed the lighthouse and cottage should be restored and adapted for current use. Love Jason's idea of a restaurant/cafe for watching the canal traffic. What about bclg starting small with a snack concession stand to generate money toward restoration? Can the city help with that? There are lots of people around out there. Any historical reference should include info about Indigenous uses of the area as well as colonial. That would be "John Graves Simcoe" not "John Simcoe Graves." Agreed. We should do everything possible to save these historic (and possibly useful) structures. I'm a regular down by the bridges for walks and just recently discovered the little parking lot at the foot of the lighthouse as a great place to take pictures of the bridges, as well as a great backdrop for model photography (people, cars etc). Why are we always having to protect the things that make our city unique and historic from the forces that seem determined to doom it to blandness and uniformity? Well, the lighthouse is in Ward 5, so just encourage Chad Collins to institute participatory budgeting, like Wards 1 and 2 and introduce lighthouse restoration as a project. That could provide plenty of money for the restoration (up to $1 million is distributed each year ...) since the lighthouse restoration could be a recurring annual project. Done. Tweet sent to Chad re: article, with link through to contact to the Beach Canal Lighthouse Group. It may be a better 'restoration' initiative - and result - to link the two groups: the Hamilton Beach Community with the Beach Canal Lighthouse group. Either way, some political muscle at 'ground level' would definitely help the push forward. It is my understanding that PWGSC never owned either structure but did have ownership of the land. Public Works did however replace the roof on the Keeper's house and removed the bird guano from the lighthouse back in the early 1990's. The lantern room wasn't accessible during this clean up but was done by DFO later as stated in the article. The walls of the lighthouse are five feet thick at the base and there is little doubt that it will around for a long time, in fact the cost would be prohibitive to demolish it due to it's sound structural condition. The Keeper's house is another story. 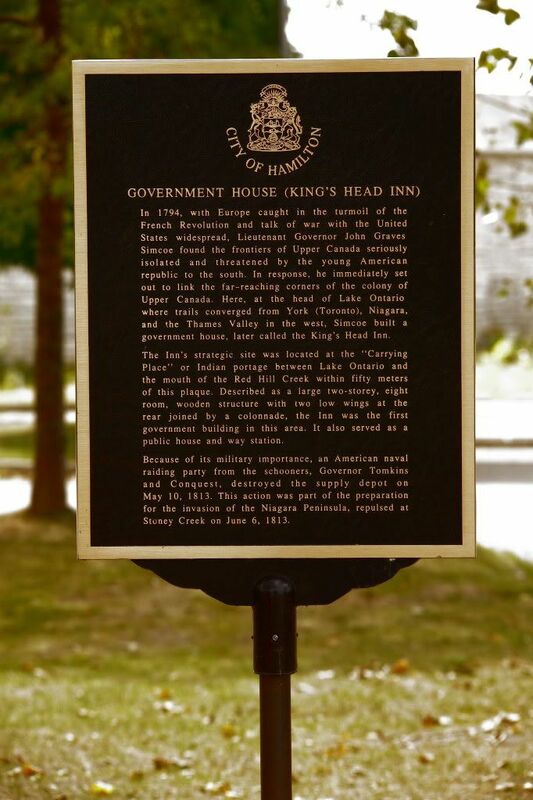 Attached is the King's Head Inn plaque located just north of Hutch's on the Trail. ”After three miles we came into good galloping ground on fine turf by the side of the lake till we came to the King’s Head Inn at the head of the Lake where Walbekanine & a number of his tribe (who are encamped a mile distant) were assembled to compliment the Gov. & fired Musquets in our Horses’ faces their usual mark of respect which frightened me & my Horse very much, he started & I shrieked, but the sound was lost in the Whoops of the Indians. They gave us the largest Land Tortoise I ever saw. Scotto, love those photos of the Beach Strip. What a great compilation of time past and time present. Thanks for sharing! Thanks Ryan, I am attaching a few more pics. 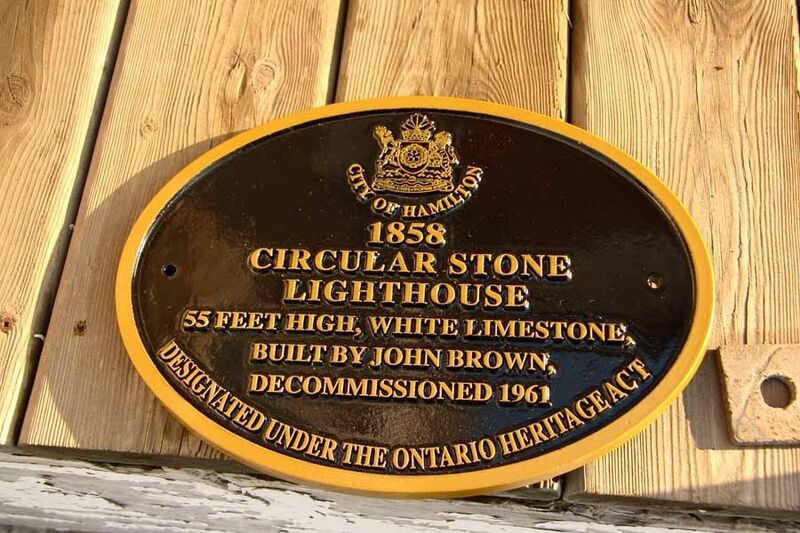 The lighthouse heritage plaque that was mentioned in the article. The bird droppings in the lantern room before the clean-up. The lighthouse Fresnel lens before being removed, cleaned and stored away. The actual limestone structure may be 'sound' with five foot thick walls at base, but the top, lamp, and mortar definitely need attention. I also understand that the wooden steps collapsed a few years ago under the weight of the bird guano. The Lighthouse Keeper's cottage is almost at the point of no return (reminds me of the derelict Freeman Station now under 'restoration' in Burlington. It's basically a complete 're-build'....) Is this cottage worth it? Aesthetically, not really. Historically, yes. Ergo, a 'dynamic' re-creation as a local pub/eatery and 'Welcome Centre' for the Trail, Lighthouse & beach strip might be a better destination and end use. .... Where there is a Will, there is a Way. If the photos you are referring to are from the Beach Site, thank you. But as you know our original photo gallery was shut down by hackers, I hope to have it back and running in the near future. As for an end use for the cottage, I see that as a real hard question. Our tax dollars just can't be thrown at projects without a clear plan and as others have written, Hamilton has many under used museums. I would love to see the lighthouse brought back to it's original condition, but what is the final cost to the taxpayer many of which will never set foot on the property? Except for a few months of the year the location is far from prime, the Port put out tenders for the land around Fisherman's Pier many years ago and received no response. In my opinion the location needs more than just the lighthouse to survive on it's own. Anyway, a few more pictures. 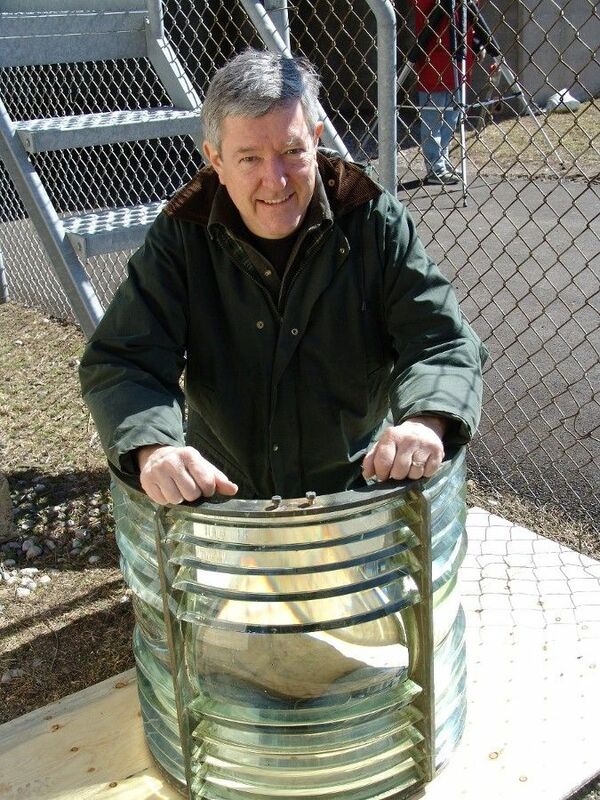 Past Chair of the Lighthouse Group, David Auger with the Fresnel lens. 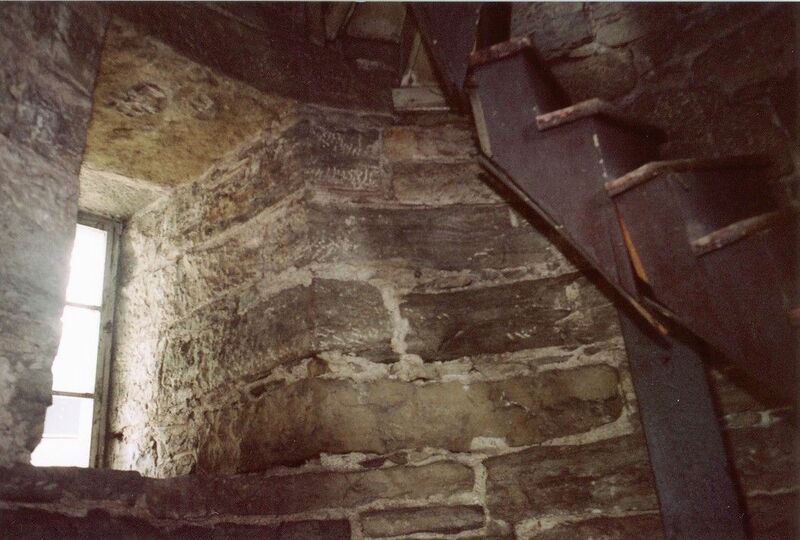 A window on the second floor of the lighthouse with the damaged wooden stairs that missy mentioned. Thanks missy, the slideshow pics are from our present photo gallery. Last one, this is one of the picture that hung on the walls at the Dynes Tavern before it was demolished. Yes the old yacht club, lighthouse and radial railway bridge. That photo would be the opposite side of the photo that was posted in the article. Ideally, the right mix would involve both public and private funding. Public - to restore this indisputable landmark of local history, (as in the City of Hamilton SHOULD back it), and private - to develop the entire canal 'site' as a 'destination'. It's a delicate balance, but can be done, with the right combination of grassroots AND forward thinking. Dundurn Castle is now a major draw for Hamilton. There's no reason the Canal area and Lighthouse site couldn't experience the same kind of 'renewal'. All it takes is imagination, drive and yes, about half a million to 'save' it. If any of this sounds like something you would like to get involved with, in any capacity, please contact the Beach Canal Lighthouse Group at bclg.ca. The more the merrier. As of September 9th, 2013, roof repairs are happening on the lighthouse keeper's cottage. WHO is actually doing this is still somewhat of a mystery, as (title) ownership of the Lighthouse still rests with the Ministry of Fisheries & Oceans. BUT, at this point, whoever it is should be applauded for taking IMMEDIATE action to save this structure. Here are a couple from today, the roof has been repair with just a rolled roofing material, but it stop further damage being done to the structure.